Well, it's been nearly 3 weeks since my last post! Thank you everyone for your kind comments on my wonky finishes. I'll be using some of the advice given to attempt to sew straight on my next few finishes. Hopefully it'll work out for me. Also, I want to say welcome to my new followers! Usually I try to post once a week but since this month has been overly hectic, I've had less time to stitch and blog. There has been some stitching though. 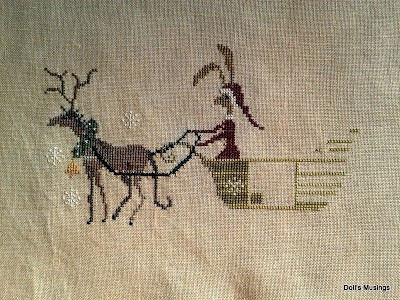 I haven't finished Hannah but I have stitched two Christmas designs. There first one is from the new JCS ornament issue. 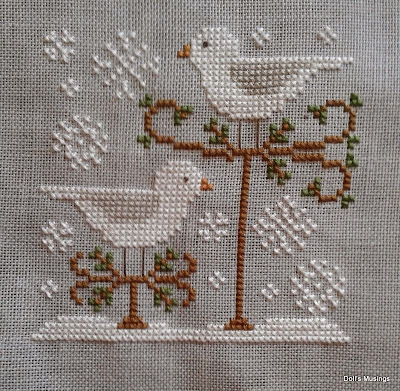 CCN's Snow Birds stitched on 32 ct. Dove Gray linen with DMC threads. I started and finished it on IHSW weekend. It was the only stitching I managed to do! Such a sweet little design and it was a fast one to stitch up. I think I'll be finishing it as a flat ornament. No sewing with this one! Then I pulled out a design I won from Pat, Southpaw Stitcher, a while ago. It's PSS's Hare's Christmas and I started it on Friday after I finished working on some kid's IEP's, I had to reward myself with something after hours of agonizing over their education plans. I switched out one of the threads, Roasted Marshmallow, for Oatmeal because the cream did not show at all on the linen. I've made a lot of progress and am nearly finished it! The colours aren't showing up very well here. It's a bit more vibrant in real life. Such a fun stitch! I'll be on the look out for some pompoms to finish this with. That and jingle bells! I think it'll be great on our door for Christmas. 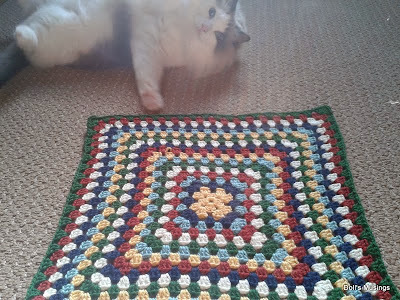 I've made a bit more progress on my large granny square afghan. Three more rounds added. Each round is taking longer and longer to crochet. Not sure when I'll ever get this done but I'll persevere!! Titus as usual got curious and started playing with the blanket. Naughty boy!! These photos have been taken with my fancy new Samsung 3 camera phone. I still use my camera but it's much easier to use my phone for taking pictures nowadays. As for stash, I was bad about a month ago. 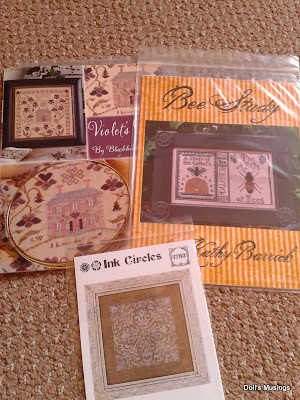 I bought a few patterns from Traditional Stitches for their anniversary sale. Like I need more charts right?!! I figured I can just start collecting charts and stitch them when my heart desires it!! I had to get the beautiful Sarah Chapple from Shakespeare's Peddlar. She's just a gorgeous sampler!! I won't be starting her for awhile as I have JCS 1707 on the backburner asking to be stitched!! 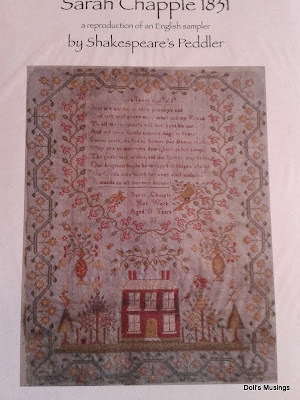 Seeing as I take almost a year to stitch a sampler, this one won't be touched for awhile.. 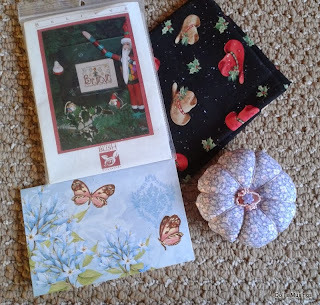 I've also received a wonderful little giveaway from Gracie, Needles Pin and Dragonflies. She made an adorable little pin cushion and added some Southwestern fabric to the package. 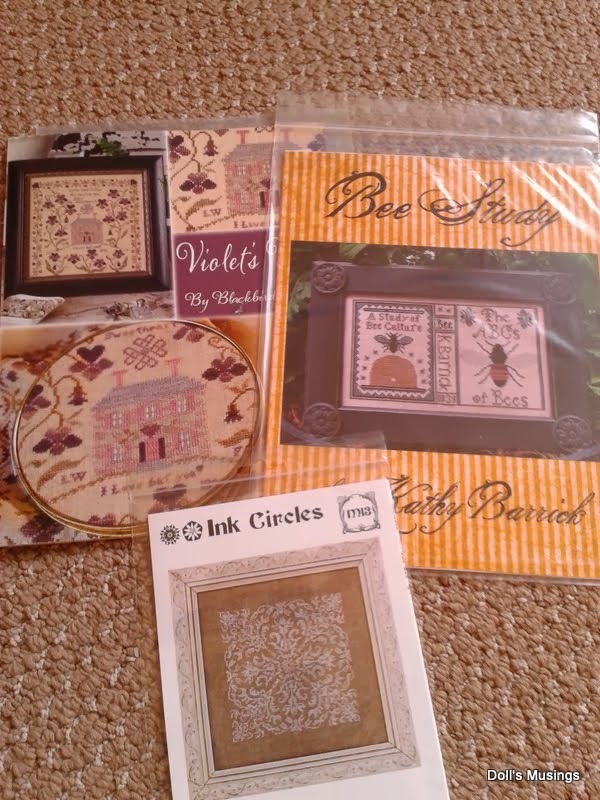 There's also a lovely little kit to stitch up for Christmas. Thank you Gracie! I adore what you sent to me!! Our October so far has been actually wonderful weatherwise. It's been so foggy lately and now we have beautiful sunshine. The perfect autumn weather in my opinion. 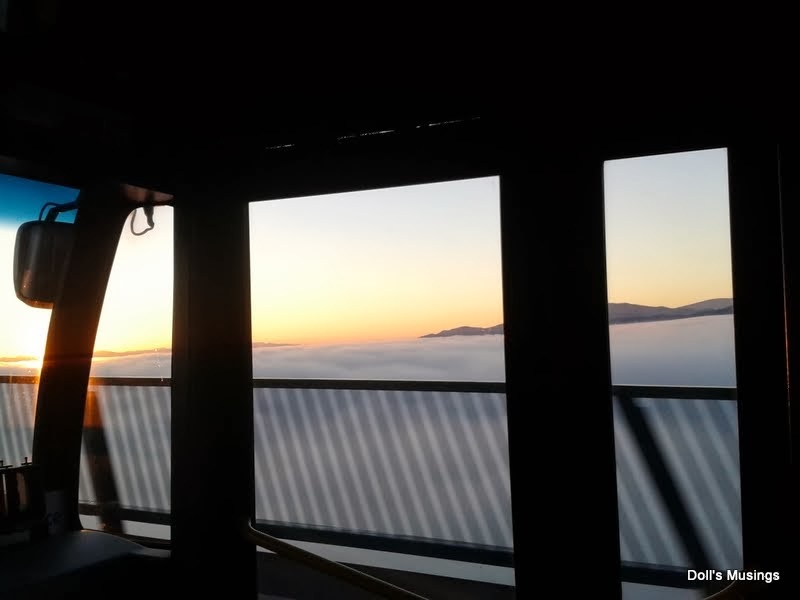 I tried taking a picture of the fog over the water while I was crossing the Lion's Gate bridge from work one evening, but it didn't quite work. It felt as though we were hovering over the clouds. So surreal!! 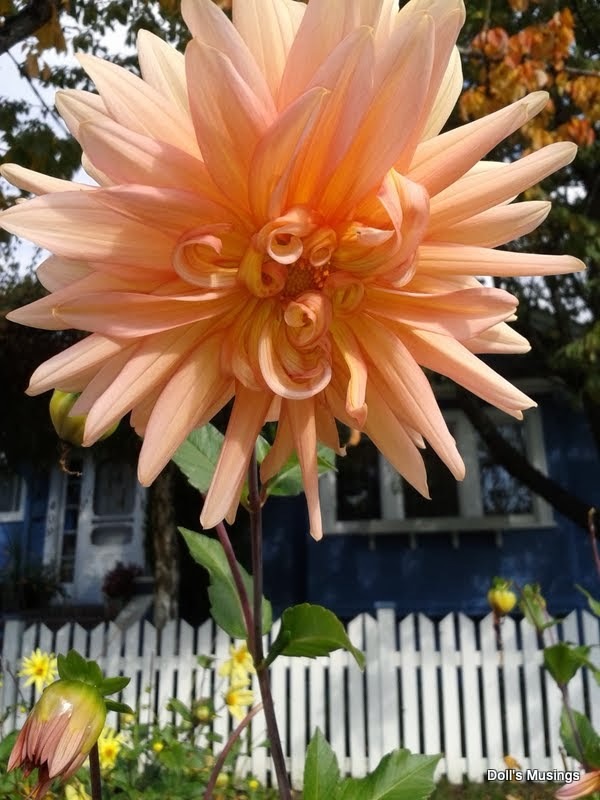 Enjoy some of my favourite fall photos I've taken this month. 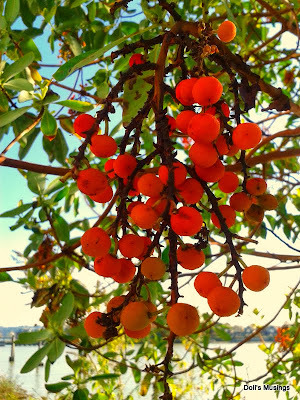 Secret little place in New West. 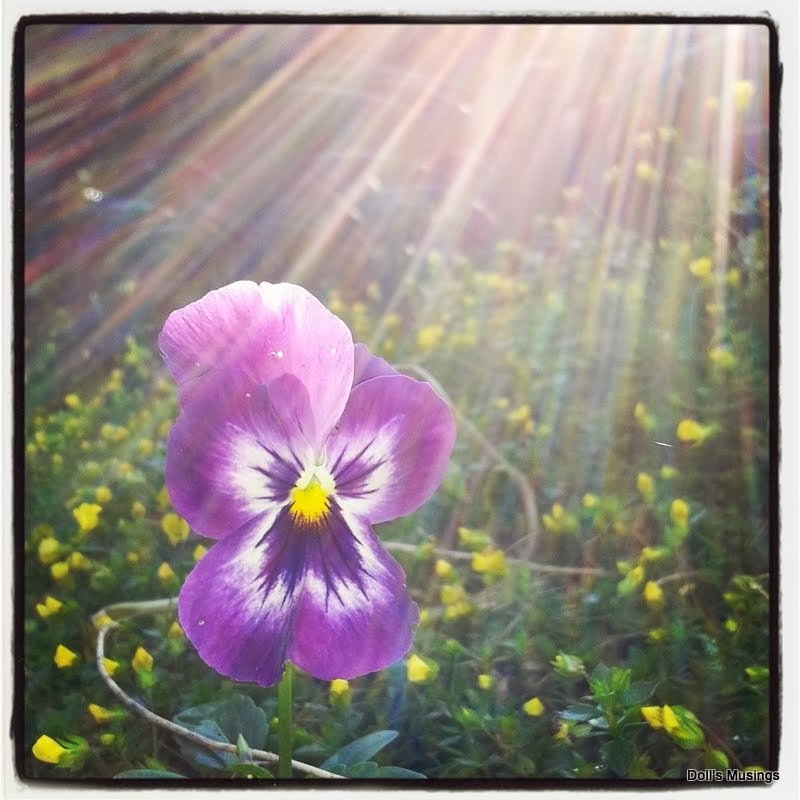 Playing around with Instagram settings!! I hope to reconnect with everyone soon. Know that I'm thinking of you all and if I could ask you to send some prayers, good vibes, etc to my husband. He isn't doing very well and I am worried about him. He was diagnosed with Hashimoto's disease, an autoimmune thyroid disease, and he is experiencing inflammation and serious pain every waking moment. Not even the specialists can figure out why this is happening. So please keep him in your prayers. PS....my giveaway draw will be this Sunday...or did I say Saturday?? Sunday it is!! Don't forget to enter!! I am sure you are giving him all the love and support he needs and could ever want, but I am sending good thoughts and best wishes to your hubby. Your photos are lovely! Sarah Chapple is on my wish list too 0 it is just so beautiful! Congrats on the ornament finish. You've taken some nice little photos there with your phone! Love your finishes and new stash. You picked my favorite ornament from the new JCS issue. Very pretty. Love those Plum Street Hares! Sorry to hear your DH is having these troubles. Auto-immune diseases are still such a mystery to the docs. 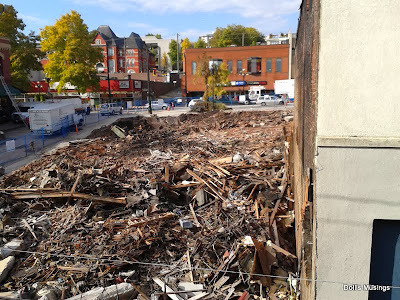 Hope they get things under control soon. Snow birds is just beautiful! Titus is looking as handsome as ever too! Lovely photo's of your stitching, stash and autumn colors. The seagulls are cute. Hoping the specialists soon can find something to make your husband have less pain and feel better. It'll be very hard for you too. Take care! Hello my dear friend ..your hubby is in my prayers and I am thinking if you all so much.. Very sweet stitching for Christmas .. I'm so sorry your dh is suffering so much! I will keep him in my prayers for a speedy resolution! I love your photos. Is that the combination of the new phone camera and Instagram? I love the CCN ornament! So cute. I haven't gotten my ornament issue yet. 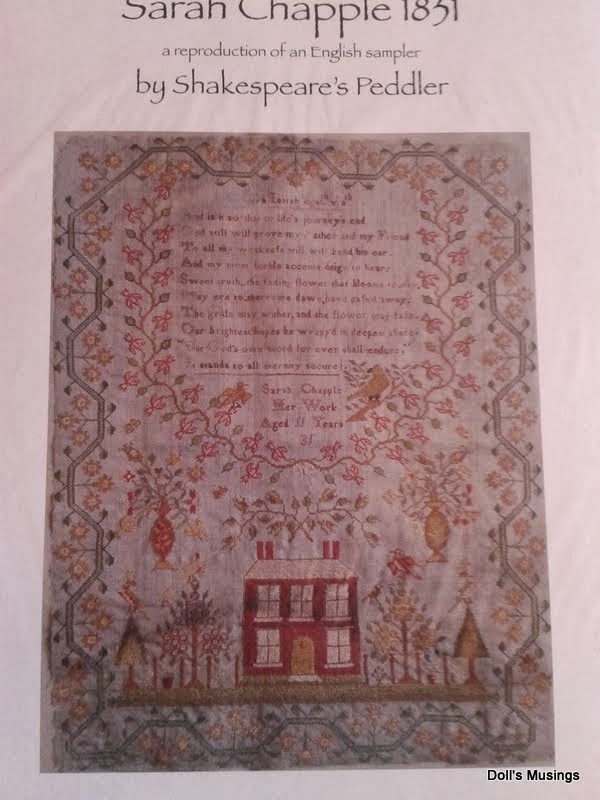 I love Sarah Chapple too but I'm not going to stitch her till next year. Beautiful finish, love these snowbirds! Sending hugs and positive thoughts to you and your husband. What's your instagram id??? I need to know! Love Instagram. :D Beautiful stitching! 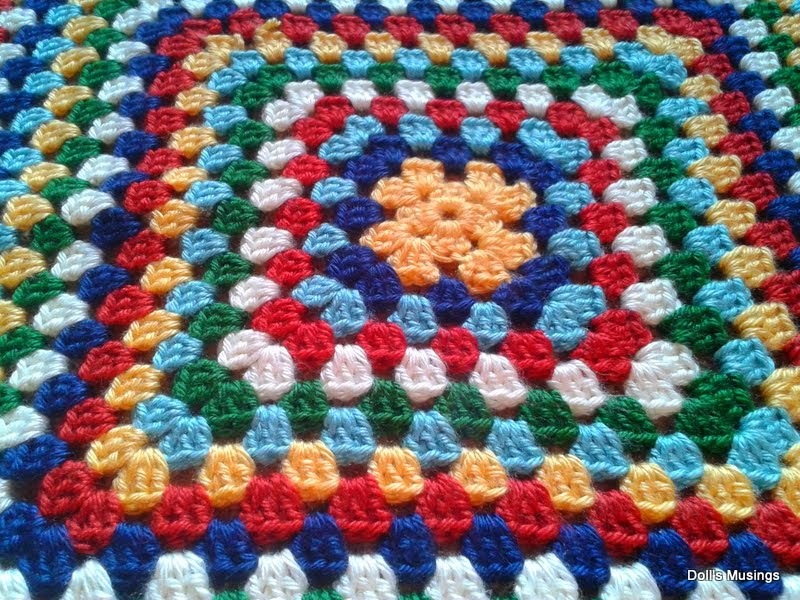 Lovely afghan too! lol about Titus! He is doing exactly what Mia does with my stole. lolol! Love the new stash! I want to stitch Sarah Chappelle too! We definitely have similar tastes. :D Lovely pics too. Oh, and I'm the same way -- I tend to just take pics with my cell camera these days. Too lazy to do otherwise. lol! All your stitching is lovely! the fall pictures are so pretty and I will keep you DH in my prayers. Some of those fairly rare conditions can be hard to live with. Keeping both of you in my thoughts. I am happy you like the package, it was my pleasure to send it to you. Cute finish! I enjoyed your other pics too. I will keep your DH in my prayers! I love the birds and Hare design. I could never stitch that massive gorgeous sampler so I'll just watch you do it! I'm sorry your husband is having health issues and hope they can help him soon. hugs and will have you both in my prayers. I must say your photos are just wonderful. Your stitching is fab and so is your stash and gift. Oh! A lovely design :) Congrats on your finish sweetie!! So sorry to hear about your hubby sweetie =/ I don't know much about it, I hope it will be easy to control de problem now that he knows, hope it won't bother him for too long =( Best wishes to him!! Send you husband prayers and well wishes. So nice to see an update! lovely stitching, great new stash and what a sweet giveaway win. 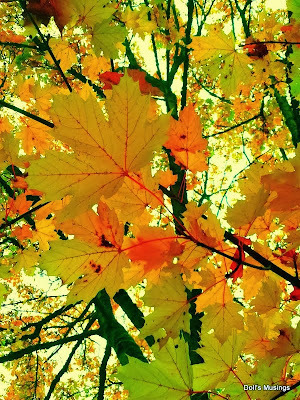 I love the fall pics too. Oh, I'm so sorry to hear about your husband, Anne--I've heard of Hashimoto's, but don't know much about it. You must be worried sick--will definitely keep you both in my thoughts and prayers. Please keep me posted on your husband, Anne--hoping the pain will ease for him very soon. Such sweet stitching Anne :) I'm not a particularly fast stitcher so I'd say it I probably wouldn't have even got that one orni done over IHSW lol. I'm so sorry to hear about your husband!!! Send lots of good thoughts and vibes for a speedy recovery!!!!!! 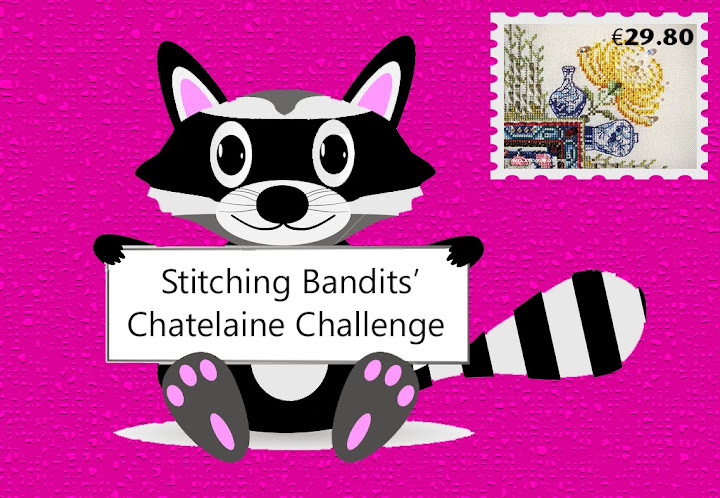 Beautiful stitching, Anne! 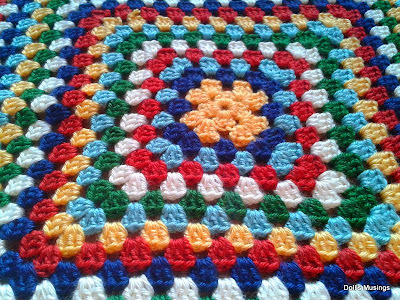 Your progress on the granny square blanket is looking good :D Hope your husband feels better soon! Beautifull Fall pictures.. really lovely! To bad of that building..
your stast and gifts are wonderfull. 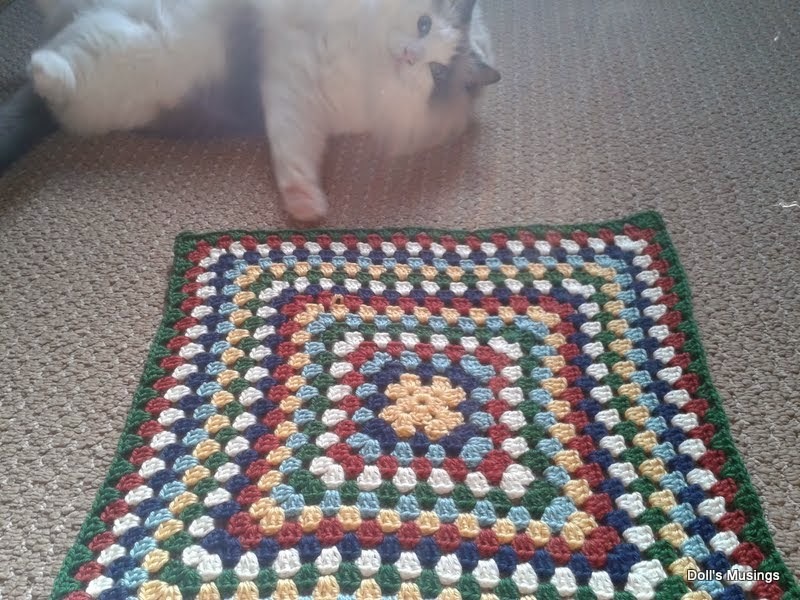 I liek your crochet blanket. wonderfull colors.. I hope things improve soon for your husband - you must be worried to bits. 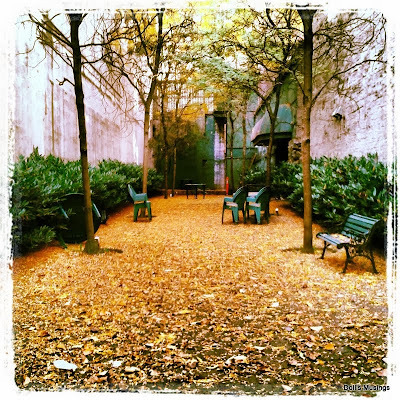 Your stitching and new stash are lovely, and thanks for sharing your glorious fall pictures. Love the JCS ornie you chose - I think that one is a favourite. Hope your hubby will improve soon. Sorry to hear about your hubby, hope they find something which helps him soon. The stitching is lovely, as is the new stash!! The white birds just remind me of seagulls as they are the only white birds we have round here! Lovely sewing, i especially love the little birds. I hope your hubby is feeling better soon. I had a virus that attacked my thyroid, the Dr.'s thought it was the same thing but it went away after a few months. Great ornament finish, loved this design too. Take care :) Thinking of you! The Snow birds are lovely & great progress on your Hare. I'm so sorry to hear about your husband - lots an lots of good thoughts for him! Very sweet little ornament. That was definitely one of the designs I liked in that issue. I'm so sorry for your hubby, I send you a lot of hugs and courage! 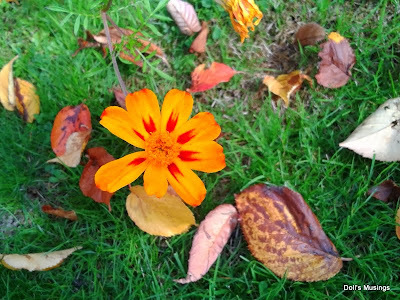 I like very much your finishes for the autumn's stitches... original and funny... lovely! 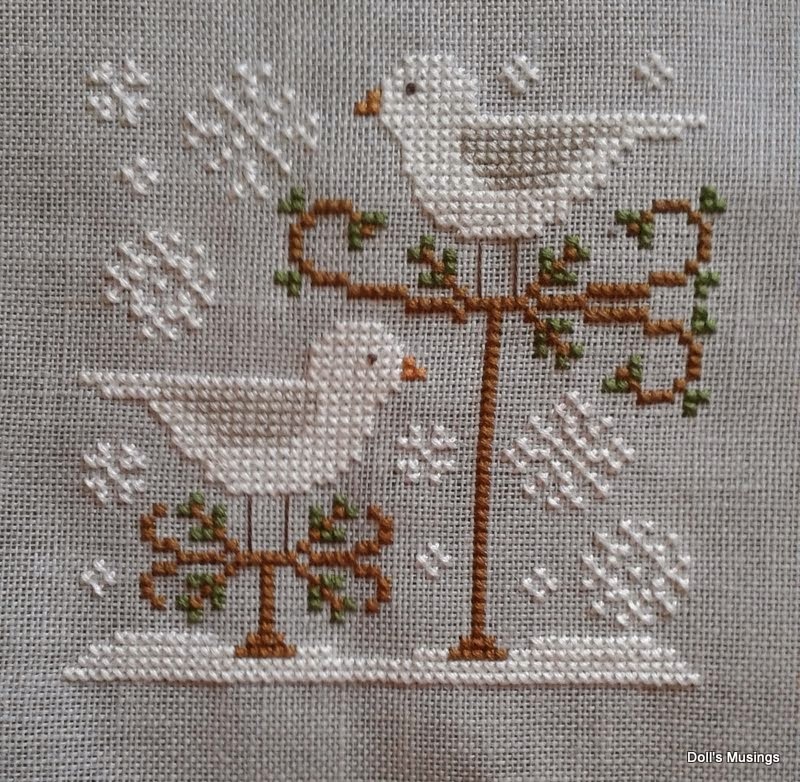 Beautiful stitching of Snow Bird. Hope your DH will have a speedy recovery. I hope the doctors can find something to help your DH and that is he pain free soon. Beautiful finish. I want to stitch this one too. It's so sweet. 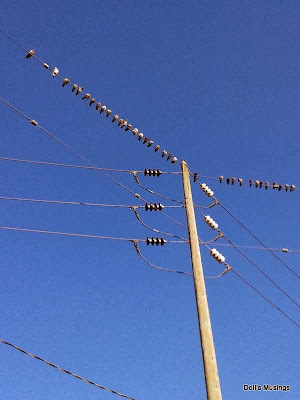 I just love your CCN little birds. Cute finish and a great start! Can one ever have enough stash? My prayers are sent to your Husband, I hope he recovers soon. Love all youe stitching and wonderful outdoor pictures.